Core Products Wheelchair Comfort Pad - Extended measures 20 x 56-1/2 inches to completely cover a reclining wheelchair. This coverage pads the calves and arms to provide total comfort in addition to pressure relief with prolonged sitting in the wheelchair. This is especially important for patients in danger of decubitus ulcers. 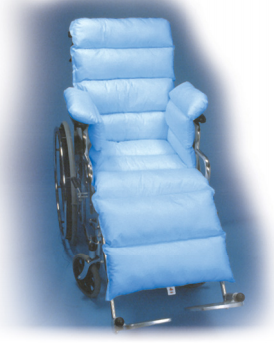 Wheelchair Cushions are designed for prolonged use. This design pads the seat, back, legs and arms. The pad is also reversible to have a water-resistant side when patient has incontinence. The other side is a soft cotton-polyester blend however if it does get dirty, it is machine washable. The polyester fiberfill resists matting and bunching after washing to ensure long-lasting use. 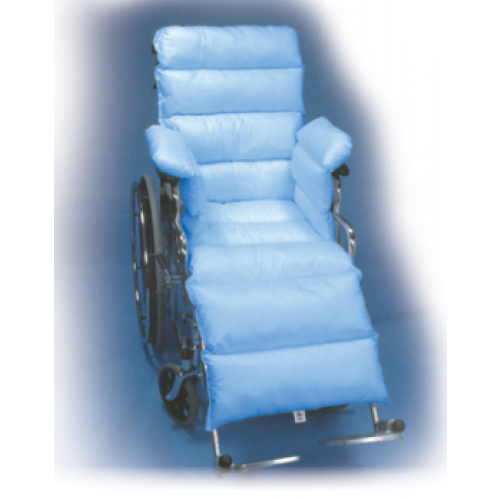 Core Products LTC-5125 Extended Wheelchair Comfort Pad is available in light blue. You may want to also check out other Core Products with similar technology such as the Bed Comfort Pad for pressure point relief while patient is lying down in bed.